Wine Tip – What is meant by a wine “Flight”? We’ve begun offering flights of wine every Thursday night as part of our new Mini Wine Classes. Suddenly, many people have asked me why we call these sets of 4 wines each Thursday a “flight”. In wine tasting, a “flight” is a set of wines, usually from 3 to 8 wines, tasted together due to their common subject or theme. In our wine classes, the 4 wines we serve could be all from the same region or area, or from the same winery, or created from the same grape. In each case, everyone tasting the “flight” tastes all of the wines side-by-side in a suggested order. Flights are a great way to set up a theme for an event of your own! Flights of 4 to 6 wines are usually best for casual groups. Any more get lost in the shuffle of many wines and people. 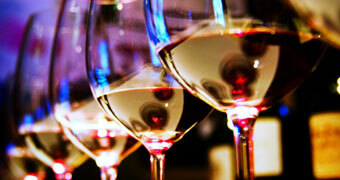 Classes and more formal presentations can have many more wines, and sometimes feature as many as 2 dozen wines or more. You can always invent your own theme if desired, but if you need ideas for a flight of wines for your next event, or want to see what’s coming up for future events at Salut!, check our Past Events or Events Calendar pages on our Salut website!